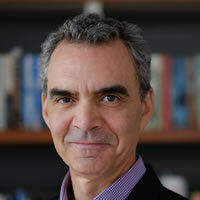 Andrew Robertson joined Melbourne Law School in 1999 and was appointed to a chair in 2006. His teaching and research interests lie in the law and theory of obligations, particularly the law of contract, negligence and equitable estoppel. He has written numerous papers on those topics and is co-author of Principles of Contract Law (5th ed, 2016) and Contract: Cases and Materials (13th ed, 2016). He has edited several collections of essays on the law of obligations and private law theory, the most recent of which is Form and Substance in the Law of Obligations (Hart Publishing, 2019). His research has been cited and discussed by various courts, including the House of Lords and the English Court of Appeal. He has previously been Walter S Owen Visiting Professor of Law at the University of British Columbia, Visiting Professor at the National University of Singapore and Conjoint Professor at Lund University in Sweden. He convenes the biennial Obligations Conference series. The tenth conference in that series will be held in 2020 at Harvard Law School and will address the theme 'Private Law Inside and Out'.